If there was such a thing as perfection, the Microsoft Surface Book would be it. This is really a marvel of engineering by Microsoft. This innovative laptop is in the high-end, premium league along with the MacBook Pro, to which it is a real competitor. Of course, as a high-end laptop it’s not cheap, but you do get a lot for that money, including an amazing screen, powerful features and a quality build. Who should purchase that expensive notebook? If you are simply web surfing, working in Excel and writing emails, please do not buy this laptop. You’ll waste your money. There are much cheaper options on the market that will do an equally good job. But if you are in the design or engineering area – or simply want to impress your clients – this may be the best choice you can make. The Microsoft Surface Book is such a quality and innovative notebook, it’s almost in a league of his own. Microsoft built a versatile detachable laptop aimed at the design – and engineering – market. The top of the line performance and a NVIDIA Graphic card will satisfy the most demanding designer and the pen makes the tablet mode very useful for drawing and writing. 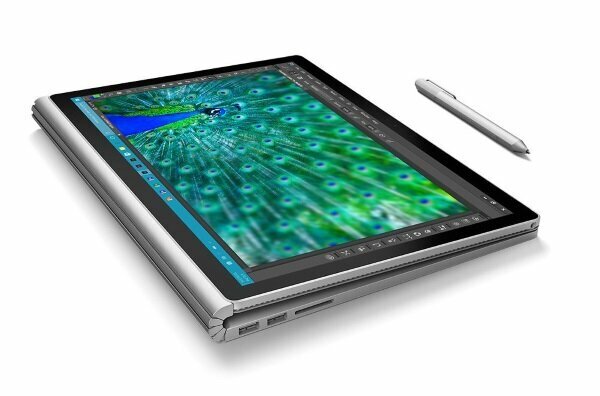 Microsoft has designed its Surface Book like no other laptop has ever been designed. They rethought the whole laptop experience to produce a versatile, useful and quality notebook. The screen detaches from the keyboard – to which it’s attached by magnets – so that you can use it as a tablet and draw or write naturally thanks to the included pen. When attached, the laptop flips 360 degrees – in virtually any position – which let you use the laptop anyway you want. That is versatile! No need to say that this is a premium laptop with top of the line build quality. The elegant silver magnesium casing feels incredibly solid when held in hand – whether with or without the keyboard – and it definitively looks high-end and professional. The only negative thing I can say about the design is the weird gap between the base and the screen when closed. This laptop is all about performance. Two processors are available, the Intel i5 and i7 and you can get as much as 16 GB of RAM. Which configuration should you choose? The i5 with 8 GB of RAM will give you the best value. It’ll give you ample performance, unless you are a heavy user that needs to work with huge CAD or high resolution movie editing. In that case, the i7 with 16 GB of RAM will give you the power you need, but will also be 25%+ more expensive. When you first lay eyes on that screen, you know that Microsoft has put every effort to make it a high quality 13-inch. With a 3000 x 2000 resolution, it’s on par – maybe even better – than the Retina display on the MacBook Pro, it produces accurate and vivid color and the brightness is probably the best you can find. I think the choice of having a 13.5″ is the best they could make; it’s a great middle ground between screen real estate and portability. 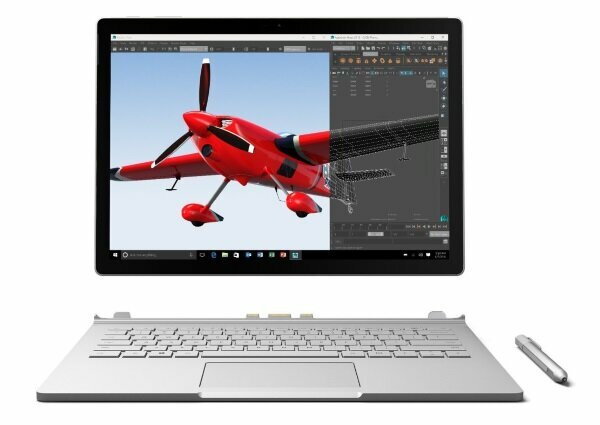 Microsoft equipped its Surface Book with an NVIDIA graphic card that will allow demanding design, CAD and gaming. Note that the least expensive version comes with only an Intel HD 520 graphic card. For a product that expensive, I suggest you opt for the NVIDIA that equips all the others. The Microsoft Surface Book is available with SSD ranging from 128 to 1000 GB. If that’s enough space for you, choose the 256 GB, it’s the best value. Anyway with the two full-sized SD card readers, you can easily add more storage space if you need to. It also has two 3.0 USB and a mini DisplayPort. No need to carry around your charger for the day, with an ‘up to 12 hours’ battery life, you won’t need it unless you do quite a lot of overtime that day. As you can expect when you spend that much on a laptop, the two-speakers are of high quality. You’ll be able to watch a movie or enjoy your music even if you are not close to your Surface Book. It’s still a laptop, so don’t expect much bass or anything as loud a real speakers, but as far as notebook speakers go, this is pretty much the best you’ll get. The keyboard is everything you could expect from a laptop of that price: comfortable, precise and backlit. The touchpad is big and the multi-touch is precise. 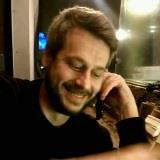 And what about the pen that has 1024 pressure level and that’ll impress even the most seasoned designers. The Surface Book comes pre-installed with Windows 10 Professional so it’s great business choice. Unfortunately, Microsoft could have improved on the warranty: at that price, a 1 year warranty sounds a little short.